This article is focused on tank-type water heaters – the most common and easily recognizable. Also called storage water heaters, these classic cylindrical tanks both heat and store the water, keeping it continuously hot and ready for use. Hot water is produced by burning fuel such as natural gas or propane, or using electricity, to generate the heat used to raise the water temperature. Natural gas water heaters are still the most common, probably because they are generally more efficient than electric water heaters. Gas water heaters can heat the water to set temperature about twice as fast as electric heaters do, and cost about half as much to run as an electric unit. There are two classifications of commercial gas water heaters: High-Efficiency (HE) water heaters and Standard (atmospheric) water heaters. Each type of unit offers different hot water output, necessitates different installation requirements and varies in terms of maintenance frequency and cost. 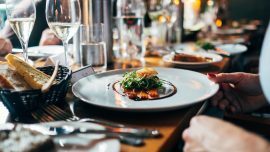 The more you know about these variations, the better you can make the right choice for your establishment. Efficiency is measured differently for commercial gas water heaters than for residential units. Only residential consumer grade water heaters (defined by having a gas input of 75,000 BTU or less) are tested & assigned an official Energy Factor (EF rating) by the DOE (US Dept of Energy). That’s why Energy Star ratings are usually only seen on residential equipment. Water heaters with an energy input higher than 75,000 BTUs are considered commercial water heaters, so they aren’t given an EF rating. Their energy rating is instead determined by thermal efficiency, expressed as a percentage indicating how much energy they can extract from the fuel they use. For commercial grade equipment (the focus of this article), ”high-efficiency” refers to units that have a thermal efficiency of 90% or higher. Anything lower is considered “standard,” though by law all water heaters must be at least 80% efficient. There are actually many similarities between standard and high-efficiency tank-type water heaters. But, there are very specific design differences between them that drive the efficiency levels, as well as govern the installation requirements and restrictions. These would be the “technical details” so we’ll try not to bore you with them. Standard gas water heaters are also called atmospheric units, mainly because they require oxygen from the immediate atmosphere for the combustion process to heat up your water. The workhorse of water heaters using time-tested technology and production, standard water heaters are easy to install with limited restrictions (more on that later). The burner produces a flame within an open combustion chamber beneath the metal tank that heats the water from below. That combustion process creates hot waste gases that need to be vented outside; this is done via a metal flue (or multiple flues in units with higher BTU inputs) that sits above the burner and runs the length of the tank. There is a flue baffle within the flue that slows down the flow of the gases, utilizing the heat transfer process to increase efficiency by allowing the excess heat from those gases to be transferred to the surrounding water as they naturally make their way up and out of the heater, before they are safely vented out of the building through the chimney. This design allows a standard water heater to extract at least 80% of the heat generated by the gas to heat the water – which is still a majority. But, 15-20% of the heat still escapes out the chimney unused. Think of it this way: for every dollar you spend heating water, approximately 15-20 cents goes up the chimney. 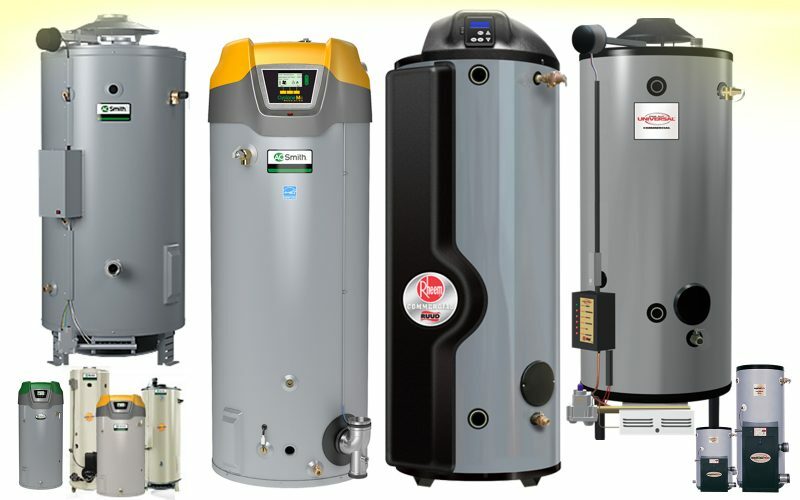 Just like standard water heaters, high-efficiency water heaters extract heat energy out of the exhaust gases to heat the water, but they include a secondary heat exchanger that maximizes the heat transfer process to extract as much heat energy as possible out of the whole combustion process. Sealed combustion is the first key to higher efficiency. That means the combustion process takes place in a sealed compartment (no open flame, no heat lost) inside the tank itself, surrounded by the water it is heating. The water is then able to heat faster from the center out, rather than from the bottom up. Sealed-combustion water heaters maintain the “seal” by using designated intake and exhaust pipes to connect them directly to the outside. They are controlled so when hot water is needed the blower kicks in and draws air directly from outside into the combustion chamber with the fuel, and the exhaust gets power-vented directly out the building (via same blower) through another designated pipe, rather than through a chimney. Condensing is the next key process to higher efficiency. A second heat transfer process is achieved by lengthening the exit path the exhaust travels using a secondary heat exchanger, frequently featuring a coiled design for maximum surface area, though some models use a reversed travel path (down, up, down again). And as this heat transfer occurs, the exhaust gases cool to the temperature where water vapor condenses out of the exhaust’s air stream back into liquid water (just like water from the air condenses on the outside of a cold drink), releasing the latent heat of vaporization which is used to further heat the water in the system. (The resulting liquid condensate leaves the system via a designated condensate drain.) The exhaust gases end up cool enough that PVC pipe can be used for the venting, but those gases also lose stamina as they travel, which is why all HE units are power-vented, e. fan assisted. It’s worth mentioning that sealed combustion water heaters come in both condensing and non-condensing models (usually just referred to as direct vent), but the condensing models have closer to 95-98% thermal efficiency and are the more commonly known HE units on the market. Just like standard water heaters, HE water heaters come in a variety of sizes with various storage capacities and mostly the same BTU input options these days. But still, not all settings are fit for all water heater types. Sometimes you can have your pick, but your choices could be limited by your building itself, or by your budget. Less expensive equipment. Like-for-like and size-for-size, these units are cheaper than their high-efficiency counterpart. Cheaper installation because venting is standard and relatively simple. Install isn’t as complicated and therefore, it’s less expensive. Less servicing hassles. Because there are fewer electrical components, parts and service providers are easier to come by and often less expensive. Easier installation in older buildings. Standard units have used the same basic original setup for decades and still simply require a chimney to exhaust or vent, which are more common in older applications. Not very “green”. Obviously they aren’t as efficient at using the fuel they burn. Requires fire-rated room because of open flamed combustion chamber at the bottom of the unit. Municipal code for fire-rated room compliancy demands that your room has many fire-resistant features, such as a steel door, walls that can withstand very high temperatures and much more. Adequate make-up air is a necessity. Because an atmospheric unit requires oxygen from its immediate atmosphere (hence its name), if not properly sealed off, it will eat up the air from surrounding internal building space. You’ve experienced this type of negative air pressure before. Say you’re entering a restaurant and the door is hard to open. Between the kitchen vent hoods and the heater pulling air out of the building, that building probably needs a better source for make-up air. If make-up air tries to enter through the chimney, the exhaust can’t get out. It’s called flame rollout – and that’s a problem! To prevent this, the heater must be in a separate room, equipped with a screen or vent to the outside world to get that fresh make-up air. Reduced operating costs. These HE units are so efficient because they extract a high level of heat energy (BTUs) without a lot of waste. They may use the same amount of fuel for the combustion process but they do more with the fuel in less time, which means less fuel consumption overall. So with a 95% efficient unit, only 5 cents out of every dollar is going out the exhaust pipe, which really adds up over time. Creates hot water fairly quick. Efficiency had 2 meanings in this case. Both of the heat transfer methods used in HE water heaters can heat water faster than the methods used by their standard counterparts. Does not require fire rated room. So as far as code compliance goes, it’s a lot easier. Safer. Dramatically reduces the risk of carbon monoxide poisoning and back-drafting since the combustion process is sealed off. More expensive equipment. Because HE units have more electronic components, they’re more technologically advanced, so more work goes into the production of each unit. Higher maintenance costs. Again, because of the variety of electronic components, the HE unit has very sensitive calibration requirements, so it will only function correctly when each metered component (gas, voltage, etc.) is set within close tolerances. So when service is required, you absolutely need a tech-savvy, trained technician to troubleshoot, diagnose and fix the problem. Accurate installation is crucial. 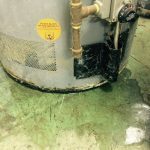 High-Efficiency water heaters have specific calibration requirements to function and the most common mistake that results from “installing without a license” is improper venting. Both the air intake and exhaust vents are tied to one blower, so when the fan spins it pulls air in from one side and blows the exhaust out on the other side. For the blower motor to serve both functions, the intake and exhaust vent runs need to be perfectly balanced (of equal length). If the intake is too long, the blower won’t be able to pull in the proper amount of air for combustion. If the exhaust is too long, the blower won’t be able to push the gases all the way out. Either way, the water heater won’t work right. This is why professional installation is vital. So, as you can see, it’s important to know the details and understand the differences between high-efficiency and standard commercial water heaters. A plumbing professional will certainly be necessary for proper sizing and installation, but the more you know upfront, the more informed your choice – and that’s good for business!